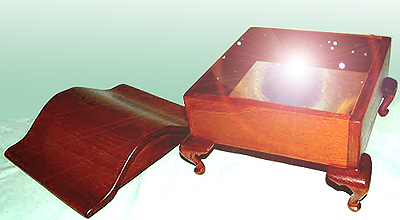 Looking into the Box... An interesting thing happens when you do your best to forget about having an NDE. It's like living with an annoying cat that you inherited from a family member that spends 90% of its time outside, but doesn't really go away. Every time you think you have moved on, you discover a tattered piece of carpet, or claw marks on the stereo speakers, and you are reminded that it is there…still lurking…waiting for you to come home again. Travel, career, politics, marriage, raising kids, having grandkids…all wonderful highlights of the years since "my dance on the other side." However, death, science, and a seemingly unending succession of news from friends and relatives fighting various forms of cancer, finally conspired in a manner that brought me running to "the box" that I had neatly placed on the back shelf of my consciousness. It started with the news of a dear friend, and her husband's recurring battle with a brain tumor. Then news of the sudden death of two High School friends, followed by my Mother's bout with breast cancer, and a recurrence of prostate related cancer with my father. The nagging, quiet pounding of ambiguity began. While I was upset, and afraid of the loss of my friends and family, I knew innately that this life was far from "all there was" to our existence. While the fear of losing those close to me was becoming palpable, the knowledge that you never really completely lose those you love, was both a comfort and an annoyance. Furthermore, watching almost all of them struggle with questions of religion, and spirituality in their times of need, while knowing that there was far more to the equation than simply asking a favor from a "kindly old man in heaven," added to my discomfort. Having been shown that traditional religion was far too limiting, and yet knowing that the complete answers were almost too complex to give comfort, I found myself resolved to silence. The silence came not only from conflict between traditional rhetoric and fundamental practice of traditional religion, but my inability to communicate a broader context of reality, in language that bridged the gap. In December of 2009, the box began screaming to be opened. After almost 4 years of good news of clean MRIs, and other tests indicating that his treatments were working, the four-line email that my dear friend's husband had lost his battle with cancer showed up in the "in box" of my Gmail account. Within days, she had contacted me, to ask if I would sing at his graveside service, and to let me know that she had something to tell me, that only I would understand. The first part of the news was difficult enough, as her husband was one of the nicest, most gentle, well-loved guys you could ever know. And yet, I had no idea what would be appropriate at his celebration. She suggested Vince Gill's "Go Rest High On the Mountain." This is a beautiful song, Gill had written at the passing of his brother. However, at only two verses, without a fiddle, or another instrument to stretch with a solo, it felt too short, and almost irreverent at such an important event. So, I asked Patti if she would mind if I wrote an extra verse. She said, to "do whatever you want, I trust you." Knowing of her long-standing Catholic upbringing, as well as the Mormon lineage in her husband's family, writing something with a traditional religious flavor seemed more than appropriate, in fact necessary. I opened my heart…pictured Mike, and wrote the additional verse in a couple of minutes…knowing that I was doing little more than transcribing what was given to me. "Oh Lord we ask you for your mercy. And, we ask you to sooth our pain. to know we'll be with you again…"
There is was, two short lines of a final verse…that basically defied almost everything that I had learned in my NDE. And yet…it felt right. In fact, as I sang them rehearsing the song to a point of rote performance, where I knew I could sing without weeping at the service, they gave me comfort. How could simple words, so close to those one would find in an evangelical church service, bring comfort to someone who clearly no longer believed in the mythology of traditional religion? How could a song, rife with visions of angels, and walking in heaven, allow me to feel strength and solace, and even joy, at singing? The service, the song, and the day went off as planned, with as much grace, sorrow, loss and comfort as one can expect from such a sad occasion. Old friends reunited for a post-service gathering. Memories were shared, and love filled every soul. As I was getting ready to leave, Patti asked me to go outside for a moment. Once outside, she thanked me for singing, and then told me that she had almost called me on the day of Mike's death. She then went on to tell me that Mike, before he had passed, had promised to try and send some sort of signal to her from the other side. As Mike was a fan of all things abnormal and paranormal, she was neither surprised nor taken back by the statement. However, as Patti relates the story, at the exact moment of Mike's passing, with a room full of his closest friends and family at his side, two clocks in the room, suddenly began spinning forward, wildly. Everyone made note, and then moved through the range of emotions that would follow such a combined event. Asking the charge nurse if anything had gone askew with the hospital clock system, brought nothing but blank stares, and denial of anything "going wrong." Patti was understandably excited, and perplexed. It was at that point, that the box rattled off of the shelf, the lid splayed on the floor, and I vowed to stop hiding from the knowledge that had been shared with me years prior. I assured her that what she had told me was both exciting, and amazing. And also, that Mike's love had obviously transcended traditional space/time to let her know there was indeed more than the suffering they had all experienced here on earth. And that while I didn't understand it, that I wanted her to know that I was open to talk about it if she chose. Just like trying to get that rogue cat back in to a travel carrier only brings about more chaos, confusion and scratches as it reminds you are no longer in control, the accelerated series of events that transpired over the course of the next few years, has been wild, terrifying, awe-inspiring and a constant challenge. More death, some protracted, and some sudden, as well as more challenges from the traditional bastions of religion, and an amazing series of "coincidental" events and multimedia discoveries, have all conspired to firmly and finally destroy the lid to the box altogether. I have finally realized that my strange gift of being able to distill complex ideas down to communicable forms--even using traditional "God Speech" when needed--is indeed something that needs to be used to its fullest capacity. And now, looking back, on the original NDE piece I wrote, keeping this amazing experience in a box, was in fact breaking the "Third Commandment" of the basic commandments I learned from my experience; "Use all of your talents to their fullest capacity. Not doing so is to defile your very existence." So here, my dear reader, fellow sojourner, believer or skeptic, I state clearly: I will continue the journey, the exploration, and discovery, as long as I am graced to take breath in this life. I know clearly there is "MORE" than traditional religion or traditional science would have us accept as "the end all, be all" of understanding our reality.